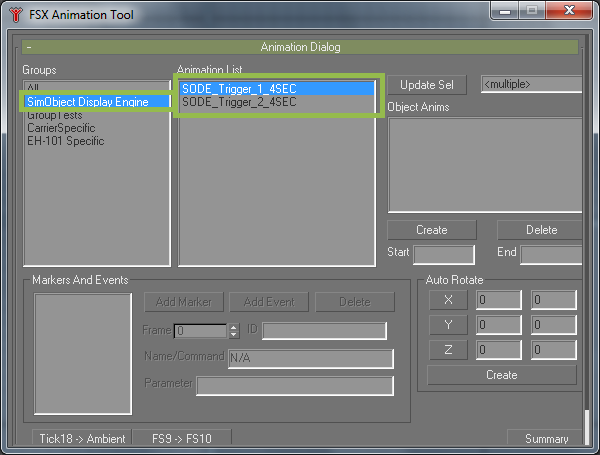 Animations are created with the FSX SDK’s AnimationManager tool. For further reference, see the SDK documentation on how to use this tool. Limitation: Only one animation can be triggered/controlled per model. The duration of an animation is coded in the modeldef.xml file via „Lag“ properties. For instance, if you want to have a 100-keyframe animation 4 seconds long, the lag has to be set to 25. Different animation durations require different „PartInfo“ entries in the modeldef.xml! Have a look at the provided samples in the SODE_modeldef_Entries.xml file to get an idea, it is really easy. ▲Caution: The activation range of the animation depends of the size of the models bounding box! If you want the object to be able to be triggered from further away, the bounding box must be increased. Please do not use the “IS LATITUDE LONGITUDE FREEZE ON” SimVar anymore. For backwards compability, SODE still uses it. For advanced animation options, use “VELOCITY BODY Z” instead, which will support multiple animations in one single model. ControllableAnimation Lower bits are used for Animation triggers. Higher bits are used for keyframe counters.